Welcome. 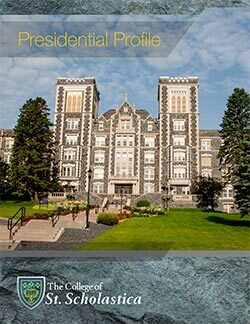 This site offers information on the College’s search for its 13th president. President Colette Geary has announced she will depart by the end of 2019. Over the coming months, regular updates will be shared with the community about our progress and opportunities for you to be involved. The Board of Trustees has appointed a 13-member Search Committee to assist it in identifying and evaluating presidential candidates. The Board has also retained AGB Search to assist the College’s national search, with Shannon McCambridge and Dr. Loren Anderson serving as the lead consultants. AGB Search brings extensive experience in assisting colleges across the country in executive searches and our consultants have specific experience working with Catholic colleges and universities. Thank you for your interest and support in identifying the 13th president of the College.